1967 CORVETTE �JUST DISCOVERED!!! ONE OWNER ORIGINAL WITH ONLY 2,996 MILES!! !�THE ULTIMATE TIME CAPSULE!!! LAST DRIVEN REGULARLY IN OCTOBER 1967!!! 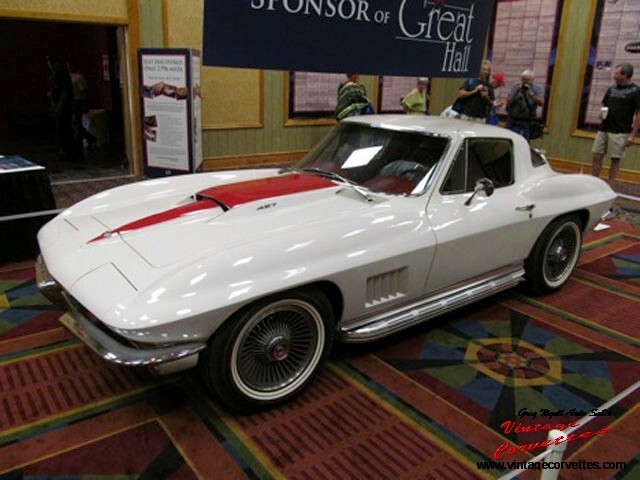 Extraordinary and the ultimate "time capsule" 1967 corvette!!! Purchased april 2012 from the estate of the original owner!!! Unveiled to the world and displayed in the entrance of the 2012 bloomington gold "great hall". An amazingly all original 1967 427/390 4-speed corvette coupe in rare ermine white with red vinyl interior and red stinger hood. All numbers are correct and match. This corvette was last driven regularly in the fall of 1967!!! It has been driven only 2,996 miles from new and is the ultimate definition of a "time capsule". This corvette has been stored from the time it was purchased new on may 20, 1967 until april 2012, in the total darkness of a one car, climate controlled garage in the low humidity of colorado springs, co. As a result, it has been unbeleivably preserved with no fading of any surfaces and no deterioration of any material. The paint, chrome, stainless, carpet and interior are all in amazing "as new" condition. It is as beautiful as when new!!! Incredibly it still smells new!!! This corvette was built on may 10, 1967 and is equipped with its original l-36, 427/390 with 4-speed, tinted glass, original bolt on wheels, side dual exhaust, telescopic steering wheel, am/fm radio, original floor mats, and 3:36 positrac rear axle. This car has never been disassembled and has never been touched by anyone other than the original owner and may be the finest, most well preserved, lowest mile, original 1967- 427 corvette stingray on the planet! TIRES STILL HAVE 1967 AIR IN THEM! THIS CAR MAY BE THE FINEST, NEVER DISASSEMBLED, LOWEST MILE AND MOST WELL PRESERVED ORIGINAL 1967 - 427 CORVETTE STINGRAY ON THE PLANET!!! But perhaps the car in the Great Hall which has been generating the most buzz is stationed right inside the main entrance. It's an original, unrestored 1967 Corvette 427 coupe. With only 2996 miles on it. Which hasn't been driven regularly since October of 1967 or at all since the mid-1980's. Only three people have ever sat in the car and nobody has ever been in the passenger seat. Only a dozen people have seen it before this week and only eight had seen it until February of this year. The seat belts have never been out of the retractors, the jacket on the seat has never been removed, and it hasn't been washed, cleaned, sat in, or touched since it was found. A survivor in the most extreme definition of the word. A 1967 Corvette 427 coupe with 2996 original miles barely qualifies to be called a used car. The Great Hall is just that. It's a full-blown "Oh Wow!" experience and right now I'm heading over there again. The mountain is waiting. Motor & Transmission By John Kuiper Race Engines. Suspension & Brakes By Ron Missian Motor Sports. To See My Build Album Click On Any Of The Below Pics.